"Thank YOU for providing us the opportunity to do so, along with the space and the instruction weaver! "...Our last drumming session was very powerful and it was so very enjoyable and rejuvenating as always." - if paying @ the door, please fill out the form below to hold your space. - if you cannot attend, please let us know asap so someone else take your space - thank you! the most wonderful a capella chorus in the whole-wide world! ​- more about Westcoast here at www.westcoastsings.com. - she holds a third-level master degree in the healing art of Reiki and has been initiated into the shamanic lineage of the Q'ero nation in Peru as a mesa carrier - including the ongoing study of her own Celtic heritage, shamanic healing traditions and art. 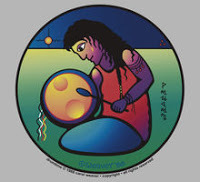 provide a safe space for us as a drum community to explore ways of healing, meditation, shamanic journeying drumming and sacred intent for ourselves and our blessed mother earth, Pachamama and of course....... have fun! ...this circle is not about 'performance' or 'ability"
it's about deep connection - from a spiritual perspective..."